My mount, Trump, had shown in two walk/trot/canter classes earlier. Therefore, we sailed into the ring full of style and verve. A little too full. It felt as if a firehose had been left on. It took a few moments of wrestling with the nozzle to bounce him back to his nice soft trot. There was only one other person in my class. As far as I was concerted, there could have been ten. One of these days, I will have to start taking in the world around me. My eyes are up – usually – but my awareness is limited to the horse/rider bubble. Still floating along from my victory pass in the previous class, I spent the first fragment of the second class congratulating myself on how well I was able to ride this horse. I finally remembered that I had to actually ride not just ponder my own wonderfulness. Yes, you read that right. I was in the ring with any walk/trotter over the age of 10. It is very likely that the combined ages of everyone else in the ring was still less than my age. Someone jokingly accused me of beating up on the kids. Abso-bleeping-lutely. Outside of the ring, I can behave with reasonable amounts of politeness and grace. Once I go in the ring, It. Is. On. I will do everything I can – within legal and moral boundaries – to blow your doors off. I expect the same treatment from you. In order to smoke said youthful competition, I tried to improve my position over what it had been for the previous classes. As I went into the ring, I heard, “Lean back.” I did and immediately fell behind the motion. Trump was not pleased. In the photos (see below), his ears are turned back at the beginning of the class (photos C13-089-002/3). He scooted down the long side wailing in anguish while my smile turned into a teeth-clenching grimace and I hung onto my position by brute force. Unfortunately, Trump has a high reveb. When the time came to walk, I got myself reorganized but Trump was still agitated. I softened my seat. I asked him to walk. I tried to tell him the fire was out. No dice. I finally heard – from the other end of the arena – my instructor’s voice yelling, “Walk!” with an undertone of, ‘Will you please just walk the darn horse already.’ I gave a heave and downshifted Trump to a walk. I reversed, stirred in a bit of hunt seat to get my weight centered, and asked for a trot. No problem. He was as soft and as perky as a horse could be. He doesn’t hold a grudge. In the past, Trump had all five gears installed. The rider needs to be clear about asking for trot or canter, otherwise he defaults to rack. If memory serves, the only time I had him racking was for the third victory trot. Trump was done. He wasn’t used to having multiple riders nor going in and out of the ring multiple times. He was tired of playing lesson horse. He was tired of being mistaken for Sam. Disclaimer – don’t download. Yes, I perseverate on the subject. People around the Internet are starting to notice that shows don’t have photographers anymore. Wonder why? 2013 Chattanooga > Saturday Morning > class numbers above. Chestnut horse, black pants, blue vest, helmet. … or absence thereof. After specifically getting my camera back from the repair shop for this show, I failed to pack a battery. I have two. You would have thought one of them would have been in the camera or the charger. Oh well. Same place as earlier TN show, different barn, way more horses [Show Report]. The audio track for the drive was the middle third of The World Until Yesterday: What Can We Learn from Traditional Societies? 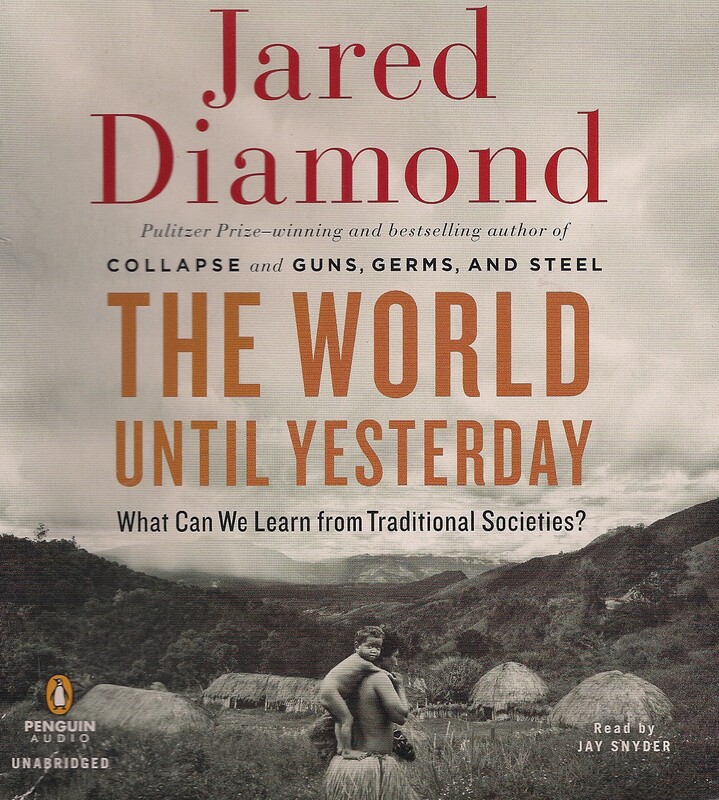 by Jared Diamond [Viking 2012], read by Jay Snyder: childhood, old age, and danger. Since the content engaged a totally different part of the brain than used for horse showing, Mr. Snyder’s soothing voice made a great stress reliever as I drove back and forth from the hotel. Has anyone else noticed how much better narration has gotten on audio books? Prior show reports and showing posts collected here. Look at you … getting one of those tilty photos. Does that mean you’ve arrived in saddleseat land? Oh, and when are they gonna let you canter? re saddleseat land: Some day, I will arrive at one of these shows, see all the tents, trailers, trucks, yadda, yadda, yadda, and then not be startled when a saddlebred walks out of a stall. re canter: Not until after the walk-trot finals in November. Nice job – particularly like first victory pass photo. Great smirk.